Frauds in advertising have been vastly prevalent in the ad serving environment. These types of scams are done by perpetrators with the sole intention of earning unethical revenue by generating fake traffic, irrelevant impressions, paid clicks by non potential users and few such methods. Advertisers have faced these issues for quite some time now losing loads of money in vain. Though different tools are sought after to counteract this, they have been merely successful. This is done from the publisher’s end when one ad inventory is sold to multiple advertisers. This would mean the ads would be stacked on top of each other. This would count as an impression for the advertiser but the end user would be able to see a single ad whichever is the top most one. This is done by fraudsters using a method called keyword stuffing. By using these means they would create a fake website and stuff it with the most popular and searched keywords, thereby drastically improving their positions on search engines. Advertisers would blindly buy the ad inventories in hope of conversions. 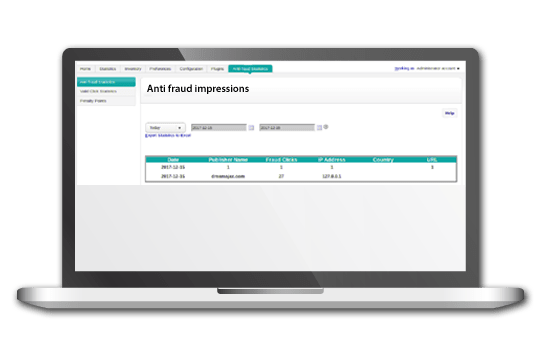 dJAX provides a wide range of solutions and enhancement to combat the ad fraud activities. The fraudsters are blocked based on the IP address and Location. By identifying the valid clicks from the fraud clicks making advertiser work simpler. Publisher will be informed about the fraud clicks occurrence through mail. 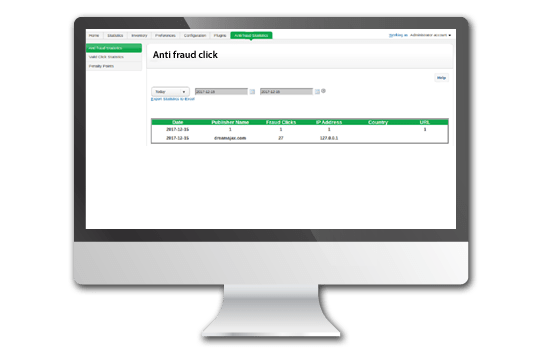 The feature of having Anti Fraud Click would provide a way to access Fraud Statistics, Valid Click Statistics and Penalty point (Publisher). The statistic report would contain information like country IP, URL for specify time duration. Threshold value and warning messages can be customized by the advertiser. Anti Fraud Impression solutions can be employed by Ad Network to eliminate online fraudulent transactions. This would stop anonymous proxies to bypass into the site. Some of the takeaways from this include Fraud Statistics, Valid Impression Statistics, Penalty point (Publisher). The statistic report would contain information like country IP, URL for specify time duration. Threshold value and warning messages can be customized by the advertiser.